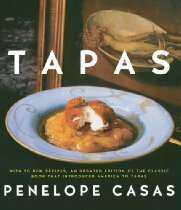 In 1985 Penelope Casas introduced U.S. diners to the world of Spanish tapas with the success of her book Tapas: The Little Dishes of Spain. Casas is a recognized authority on Spanish cuisine and has published five books on the foods of the region and writes about Spanish food and travel for several major publications. She also leads culinary tours of Spain, a piece of information I have tucked away for my future (but still unplanned) trip to Spain. Last year she published a revised version of her classic book, and I was fortunate to receive a copy for review from the folks at La Tienda. The book has over 300 recipes, of which 50 are new, and has chapters devoted to tapas in sauce, marinades and cold tapas, tapas with bread or pastry, tapas with last-minute preparation, ingredients and cookware, sources for Spanish products, and tapas menus. The ingredients and cookware section is like an encyclopedia of Spanish cooking, with detailed descriptions of such things as queso Manchego, Marcona almonds, earthenware dishes (cazuelas), and quince paste (membrillo). The menus are very helpful for planning a tapas party, and I can see us having some kind of tapas party in the next few months. The book is very thorough and the only thing I could wish for is more photos of beautiful tapas! We selected a couple tapas to make for Michael’s little birthday dinner (Happy Birthday, honey! 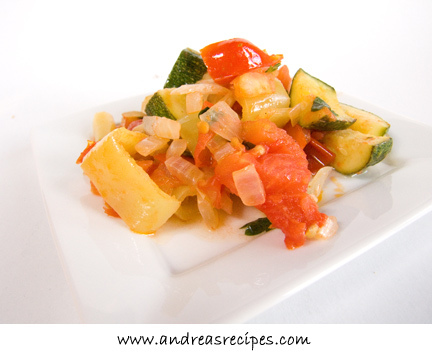 ), and I wanted to serve one with seafood and one with vegetables. I chose the Shrimp and Mushrooms in Almond Sauce (Fricando de Langostinos) and the Stewed Zucchini, Peppers, and Tomatoes (Pisto Manchego). Both have sauces worthy of sopping up with chunks of artisan bread. 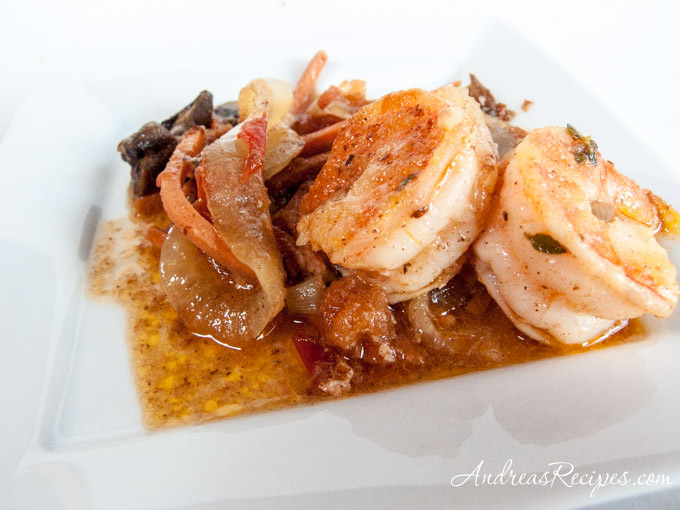 The shrimp tapa marinades overnight in a wine broth with vegetables and herbs, cooks quickly in olive oil, then finishes with mushrooms and a fish broth or clam juice. The recipe calls for straining the sauce, which we skipped because we liked the vegetables. I couldn’t resist the zucchini tapa since zucchini are in season and I have ripe tomatoes and peppers fresh from the garden. It’s an easy dish and comes together quickly. We didn’t have any bell peppers in our garden that were ready yet, but we grabbed some of our Hungarian wax peppers and added them; not traditional but still tasty. They have a bit of heat to them, much like banana peppers, so be careful if you use them as a substitute. Both tapas were healthy and delicious. I have one copy of this terrific cookbook to give away, courtesy of La Tienda. If you want to win your own copy, leave a comment telling us about your favorite tapas. If you’ve never had tapas, then say so and throw your hat in the ring anyway! Please make sure your email address is correct so I can contact you if you are the lucky winner. Apologies to my international readers, but the book can only be shipped within the continental U.S. The contest closes at 8 P.M. EST on Thursday July 31, and Random.org will select the winner. Look for the announcement of the winner in this post soon after. UPDATE: Congratulations to Shannon! A copy of Tapas: The Little Dishes of Spain is on its way to you! Adapted from Tapas: The Little Dishes of Spain, by Penelope Casas. 1. In the medium bowl, add the onion, carrot, garlic, white wine, bay leaf, thyme, cinnamon, salt, and pepper. Add the shrimp and stir. Cover and refrigerate overnight. Discard the bay leaf. Strain, reserving the liquid and all the remaining ingredients. 2. Lay the shrimp on paper towels and pat dry, then dust with flour. 3. In the skillet warm the oil over medium heat. Saute the shrimp for just a minute, turning once, then place shrimp on a warm plate and leave the olive oil behind. 4. Add the onion, carrots, and garlic to the skillet, adding more oil as necessary. Saute until the onions wilt. 5. Stir in the tomatoes and cook for a minute, then add the fish broth and the marinade. Simmer uncovered for 10 minutes. 6. Strain the sauce (traditional, but we don’t do it) and return the sauce (minus the onions and carrots) the skillet. Add the mushrooms, almonds and shrimp. Taste and add more salt as necessary. Cover and cook slowly for 3 minutes, just until the shrimp are done. Serve warm. My favorite tapas have to be Patatas Bravas (potatoes in a spicy tomato sauce) or Camarones al Ajillo (Shrimp in Garlic Sauce). Since I have moved away from Chicago, I have missed the many tapas restaurants the city offers. I would love this cookbook to be able to cook some of them for myself. Love the blog Andrea! I’m glad I discovered your blog, by the way; I’m certainly enjoying it. My favorite tapas is from a greek restaurant, actually. They do a small plate tapas menu on weekends that is to die for. It’s a plate og greek sausage, sliced, the grilled, then drizzled with lemon juice. They serve it with the cucumber yogurt sauce that I can’t spell and warm pita bread. Best food ever. Oh boy another cookbook give away. I still have to make some recipes from the Spain book. Figs wrapped in bacon! Thats all I have to say. I absolutely love Jose Andres’ Jaleo in the DC Area. Delicious food that was my first exposure to true tapas. I’ve grown up with dim sum, the Chinese version of tapas. I also love Zatinya in DC that serves small plates of mediterannean deliciousness. La Tienda sounds like a great book that for at home tapas. Thanks for the giveaway! I have never heard or had tapas! I would love to win! i love the concept of tapas! its a convivial way of enjoying delicious small bites as we chat with friends. we often do tapas party at home with friends, this giveaway will be of such a great use to me!! and did i say that shrimp is divine! I’ve never had Tapas but they sound delish & actually sound like something my 3 boys might want to eat. They sound fun & easy. I love bacon wrapped dates. I’m also a big fan of calamari done any way. Your blog is very nice, Andrea. I’m not sure I’ve had true tapas. My friend shave tired to make vegetarian versions, but I’d like to get my hands on this book and do some kitchen experimenting! If you are interested in culinary/cooking tours in Spain, see the Epicurean Ways website. We have a number of trips you might be interested in. I’ve had tapas at a Spanish restaurant in the Baltimore inner harbour. My favorite are scallops, calamaries and mushrooms! Anything with olives is my favorite tapa. My favorite tapas is the tortilla with potatoes…but then I love almost anything with potatoes. Your shrimp tapa looks delish! Happy Birthday to Michael! I’ve had tapas once, and ever since have been wanting to try again! I tried a few things, the potato tortilla already mentioned, salmon balls in a dill sauce, and a sausage and goat cheese sauce… yum. paired perfectly with sangria!! Does a Spanish tortilla count as tapas? To me it does! I first tried it at a meson in Madrid. Oooh, I need that book. I adore tapas. I spend fortunes at Mini Bar and Ole eating minuscule bites of goat cheese and caramelized onions. I’ve never tried making it though. I adore empanadas, especially the ones my husband makes, and also the mushroom filled at Cascal’s in Mountain View, CA. I believe the shrimp and mushroom recipe listed above will also make the cut, can’t wait to try it! Favorite tapas? I love tapas because I can have so many different things! 🙂 If I had to choose I would say seafood salad–with the little calamari tendrils and all. Or just about anything with goat cheese. This sounds weird….but my fave is the Ox Tail…I have had it at a great Spanish Tapas place here in Florida. It’s so good and melts in your mouth! I have never tried Tapas but I have heard so much about them that I do want to experience the taste of them. Never had Tapas but would love to win a cookbook to give them a try!!!! Thanks to everyone who entered! I will contact the winner via email and post the announcement in the next few days.